Squeegee The familiar rubber-edged "broom" used for sweeping water from windows, vehicle windscreens, and the like, after they have been washed. Originally a nautical word, with the variation "squilgee;" it referred to the swab used for washing and cleaning the decks, and is a corrup- tion of "squeege;" which itself is a colloquialism for "squeeze." Report's March 2, 1944 edition, 60 years ago. Smith Yard built for the Free French Government. The ships were identical to the American ves- sels, save one detail ... the French ships had accommodations for wine casks. 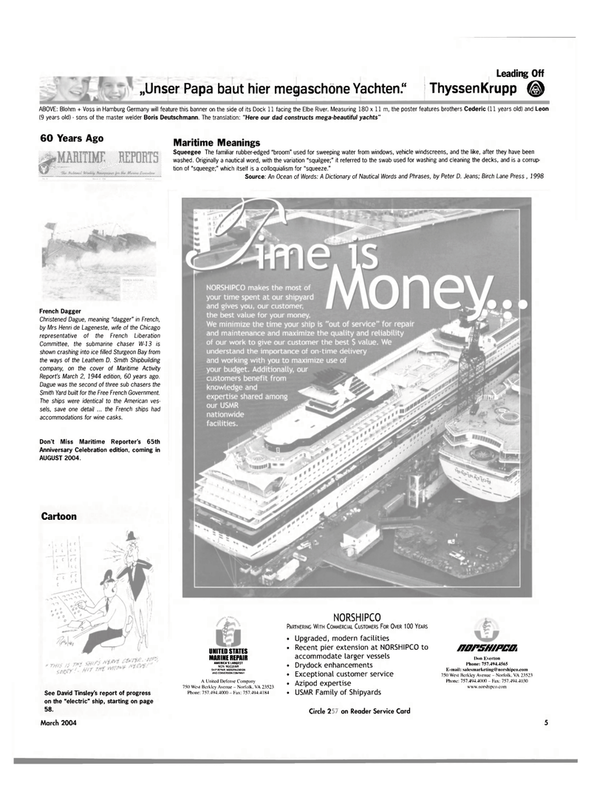 See David Tinsley's report of progress on the "electric" ship, starting on page 58.